Guns Or Roses are without a doubt the most entertaining tribute to ‘the most dangerous band in the world’. Over the past five years they have built up a large and loyal following throughout the UK and Europe and in July 2015 were watched by millions when they appeared in an episode of BBC One’s ‘Don’t Tell the Bride’. John Sumbler is widely regarded as the most authentic Slash impersonator on the scene, recreating each riff, solo and lick to the note. It has to be seen to be believed, and up front with Martin ‘Axl’ Colley’s powerful vocals, these two are a dynamic force to be reckoned with. 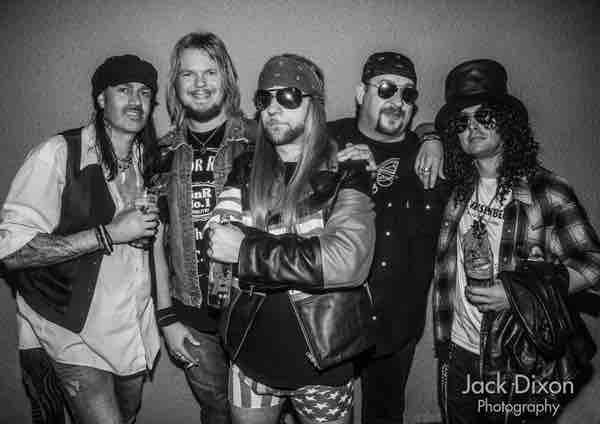 Backed by three other superb musicians, Guns Or Roses are the most musically accurate tribute you will find! Playing everybody’s favourites from ‘Appetite for Destruction’, ‘Lies’ and both ‘Use Your Illusion’ albums, as well as live elements such as the famous Slash ‘Godfather’ solo, Guns Or Roses deliver over 2 hours of high energy rock and roll, in full costume with all the swagger and attitude of the original Hollywood hellraisers. So don your bandanas, leather jackets and top hats and get down the front!